This honors-thesis project examines the migration and settlement of the Saxon “nationality” in the province of Transylvania within the Hungarian Kingdom from 1191 to 1400 (from just before the Mongol invasions (1241) to the middle of the Late Medieval Period). It attempts to understand the political and inter-ethnic effects of Saxon settlement in the context of the political, military, and social integration of Carpathian Transylvania into Hungary. The project analyzes how the Hungarian Kingdom utilized these relocated Saxons as an empire-building tool, allowing the Hungarian Kingdom to expand its empire. It also analyzes early governmental centralization efforts in Central- Eastern Europe by the Hungarian Kingdom. The differential utilization of different ethnicities became a significant topic at this time because religious differences between the Catholic Hungarian kings and the Orthodox Romanians played a part in the larger struggle for the dominance of Catholicism in Europe. 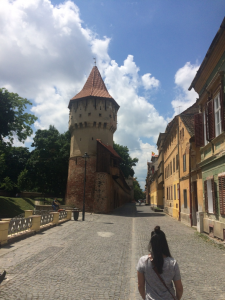 This summer, I took an archival research trip to Sibiu, Romania, one of the first major administrative centers of the Transylvanian Saxons. 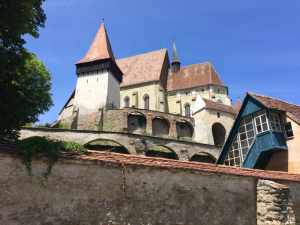 Upon arrival to Sibiu, I met Prof. Dana Dogaru, professor of German at the Lucian Blaga University of Sibiu and an expert on the Transylvanian Saxons, who agreed to help with my research. My time in the archives was limited by a combination of national holidays and protests which delayed access to the archival materials until nearly the end of my trip; however, I spent several days in the archives and got what materials I could. Luckily, I discovered that many of the documents have been digitized. Prof. Dogaru assisted me in learning how to read the centuries old, handwritten Saxon script. The time spent in the archives, though it was short, was incredibly useful, and now I have access to scanned original sources which I can (slowly) read. Upon return to the United States, I collected additional materials from OSU’s outstanding library and Inter-Library Loan Services, and shifted my focus from gathering to analyzing. I still have quite a bit to go. I have been able to find, online, four volumes of published primary sources gathered by Saxons in the late 19th and early 20th centuries, titled Urkundenbuch zur Geschichte der Deutschen in Siebenbürgen. They are divided into volumes based on the dates of the documents (going back almost a millennium) and attest to Saxon presences and colonization. 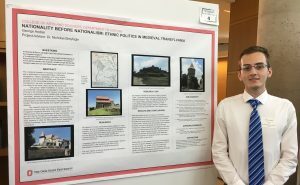 My thesis will explore Saxon colonization, the Mongol crisis (first Mongol invasion), rebuilding, the Second Mongol invasion (which took place in 1285 and was repelled), internal struggles, and the lasting impact of these events. There are two skills that I believe I have gained that will be invaluable to my future aspirations: (1) the ability to read hand-written medieval documents in the script of the Saxons and (2) the research method that I had constructed for myself. The handwriting of the Saxon notaries, of course, varied greatly, but there were many patterns and symbols that one can only learn in-person with a professional. I am very thankful that Prof. Dogaru took time out of her busy schedule to come with me to the archive and instruct me in the script. Without her assistance, I would have been completely lost, for while the German was similar to modern German, the letter fonts and symbology were radically different. Very importantly, I know how to access scanned documents through the archive’s website. The research method that I have come up with is more than just reading the sources. I have come up with a way of indexing the materials that I read and wish to use, noting content, page numbers, and personal comments/thought process at the time of reading and analysis. This enabled me to make connections between texts, both secondary and primary. While We Live (Medan Vi Lever) – International trailer from DFM_FEATURES on Vimeo. 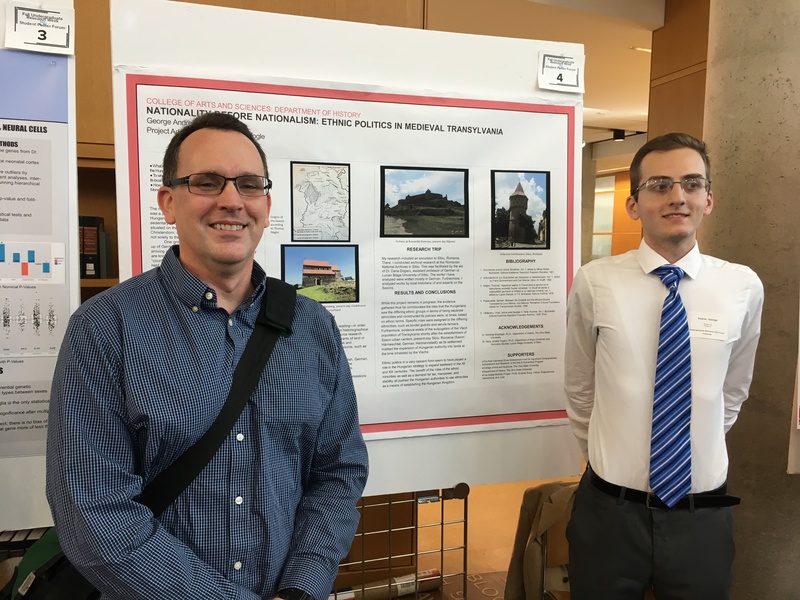 Presented by OUR&CI and the University Libraries, the Fall Undergraduate Research Forum is a stepping stone to larger venues such as the Denman Undergraduate Research Forum. The 2017 Fall Forum is scheduled for Thursday, September 14 in Thompson Library. The event is open to the general public. Four students who are presenting at the Fall Undergraduate Research Forum participated in our Spring Undergraduate/Faculty-Mentor Grant Program. Learn more about their projects below. and the process of assimilation and settlement in the U.S.
Read Gretchen’s blog post about her summer research. 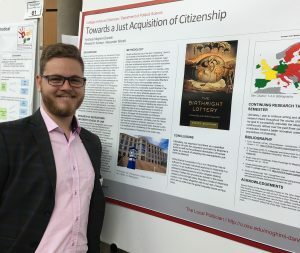 Abstract: Despite widespread use of the term “citizenship,” there is much debate in the literature with regards to what citizenship entails and how exactly it is acquired. Legal scholars, philosophers, historians, and political scientists alike have all advanced arguments across their disciplines to either support or undermine different models of citizenship and citizenship acquisition. For example, while 97% of citizens obtain citizenship jus sanguinis or jus soli, meaning citizenship by right of blood and by right of soil, respectively, there exist many moral and legal objections to these models. In my research, I examine Ayalete Shachar’s The Birthright Lottery, which essentially serves as Shachar’s entry into this ideological race. Contrary to traditional definitions of citizenship, Ayalete Shachar’s The Birthright Lottery posits that citizenship is an inherited property. While this theory advances general moral theorizations and assessments of trends such as nativism, it fails to address the jurisprudential ramifications of labeling an entity such as citizenship as being property, specifically an inherited property. In pursuit of satiating the absence of a jurisprudential nexus in Shachar’s argument, this paper applies the logic of various legal theories of property to modern models of the just acquisition of citizenship. In doing so, this paper will demonstrate how Shachar’s taxonomization of citizenship as property is an equivocation with dangerous consequences. Ultimately, once this “stress test” has been applied to Shachar’s argument, it will be clear that on normative and practical levels, Shachar’s entry is as insufficient as it is threatening to the establishment of a more just acquisition of Citizenship in the modern day. Abstract: During the 1930s, as part of the W.P.A. Federal Writer’s project, over 2,000 interviews of former slaves were completed. These interviews were transcribed and compiled into a grand collection of first-person accounts of all the former slaves who could be located at the time. Within many of these narratives, hundreds of accounts detail folktales the slaves grew up hearing in their communities. The development of these folk stories, which seem unique to African American slaves in their specifics if not in their generalities, reflect aspects of the larger development of African American culture that arose due to forced migration from Africa and, for some, their movement from the upper-South to the Lower South and Southwest as slavery expanded in the United States. Thus, these stories, along with other aspects of African American culture, arose in part as a product of the intersection of traditional African folklore and new circumstance. This research seeks to explore these stories, determining their origin and tracing their development and their dispersal. 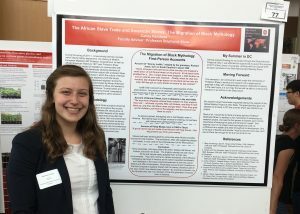 This will not only contribute to the current studies of the African Diaspora, but it will also contribute greatly to studies of the inter- and intrastate migrations of slaves that never delve into the culture of slaves and to the cultural studies of slavery that don’t pay much attention to the migrations of slaves. It is my hope through the course of this research to arrive at a more complete understanding of both the significance of African American folklore and the factors, including migration, that shaped it. Abstract: The medieval kingdom of Hungary, founded by St. Stephan, was a patchwork of many ethnicities–Germans, Hungarians, Vlachs, Szekelys, and many others–sedentary and nomadic, Catholic and Orthodox. It was also situated on the very eastern border of Western Christendom; as such, its defense was of vital importance not solely to the local rulers, but for Rome as well. One group–itself multiethnic in nature–was made up of German colonists to southeastern Transylvania. First arriving in the middle of the XII century, the Saxons, as they are known collectively today, settled near several Vlach “countries”: simple confederations of Vlach villages which held significant sway over their domains. The Vlachs, predecessors of modern Romanians, had presences in modern Romania and Serbia, and spoke Latin-based dialects. My research explores how the Vlachs and Saxons would later come to play vital roles in maintaining the Hungarian Kingdoms domains in the east. I argue that the Saxons were, from the beginning of their colonization, used as a tool by the Hungarian Crown and other authority figures in the region to expand, stabilize, and dominate the area: drawing in, after the Mongol invasions, desperately needed manpower, taxes, and support from the local populations. Reading a plethora of published sources by Hungarian, German, Romanian and other historians, both contemporary and more antiquated, as well as archived primary sources from the Romanian national archives, I will argue that the Hungarian authorities enabled the Saxons to flourish by granting specific privileges, which allowed the Hungarian kingdom to acquire land, peoples, and thus providing greater stability in the east. This research provides another view at the long history of ethnic and religious minority groups used by authorities to fill certain societal roles, one from an area often overlooked by Western historians. Read George’s blog post about his research here. 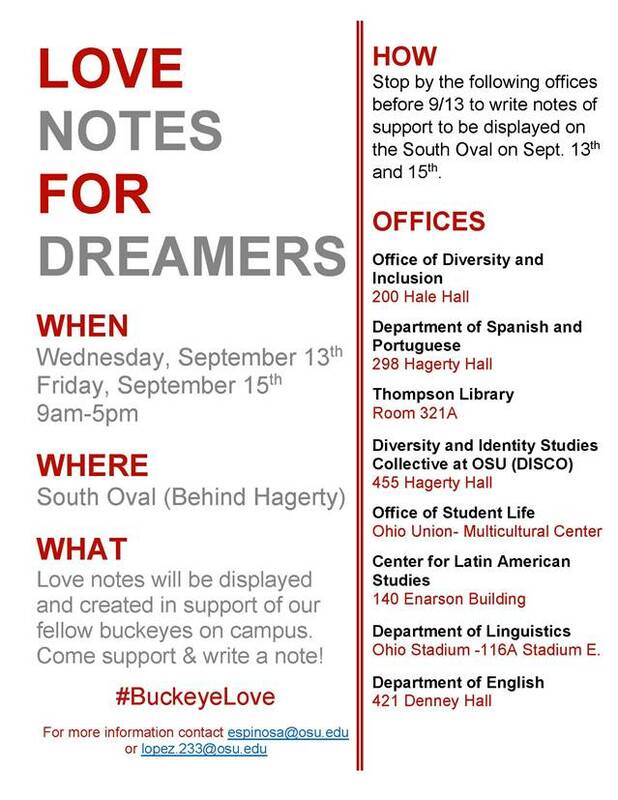 Members of the OSU community are organizing two interactive activities on the South Oval (behind Hagerty Hall) Wednesday, September 13th and Friday 15th from 9am-5pm for individuals to create and view messages of support for buckeyes affected by the DACA policy change. Messages will be collected throughout the week at various locations and turned into a visual collage on-site. In conjunction, they will be collecting signatures from faculty endorsing President Drake’s message on the DACA Decision. The year 2015 saw the highest numbers ever recorded of international migrants worldwide. Over 244 million people live outside their countries of origin, making one and seven humans on earth a migrant. Of this number, 65.3 million people have been forcibly moved due to war or persecution. With more people on the move than ever before, and with our own government reducing immigrant and refugee quotas, it is crucial that we understand human mobility from a global perspective. 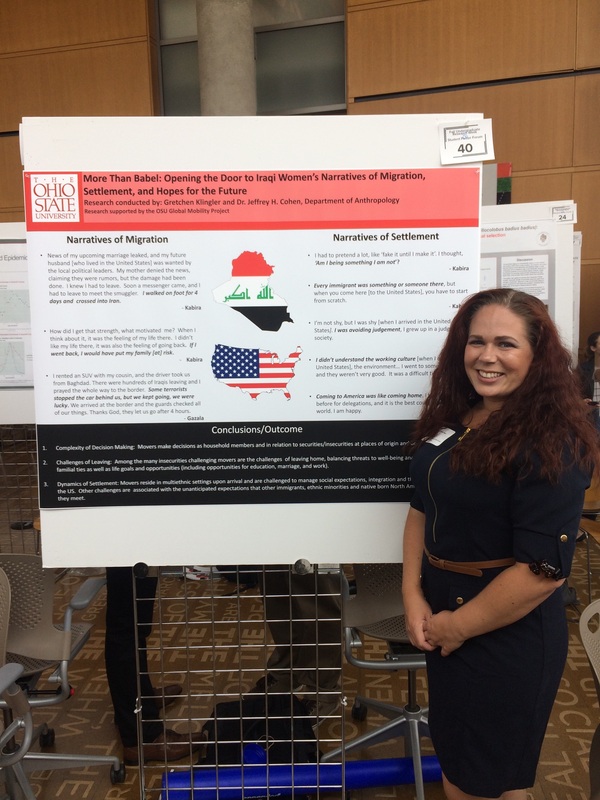 The five area studies centers in the Office of International Affairs at The Ohio State University have collaborated to create the Global Migration Discussion Group for K12 teachers. The group will meet on Saturdays five times throughout the 2017-2018 school year. 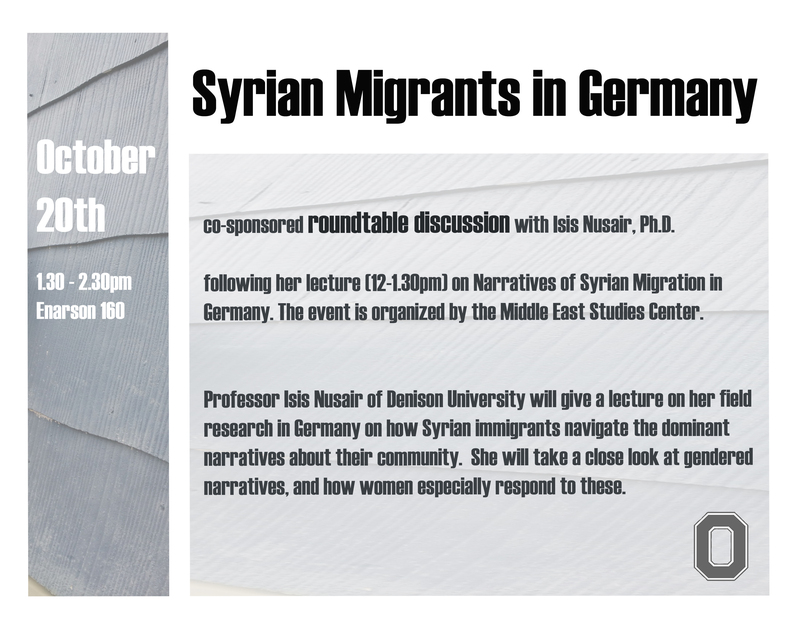 The group will explore trends in migration in Africa, East Asia, Eastern Europe, Latin America and the Middle East. 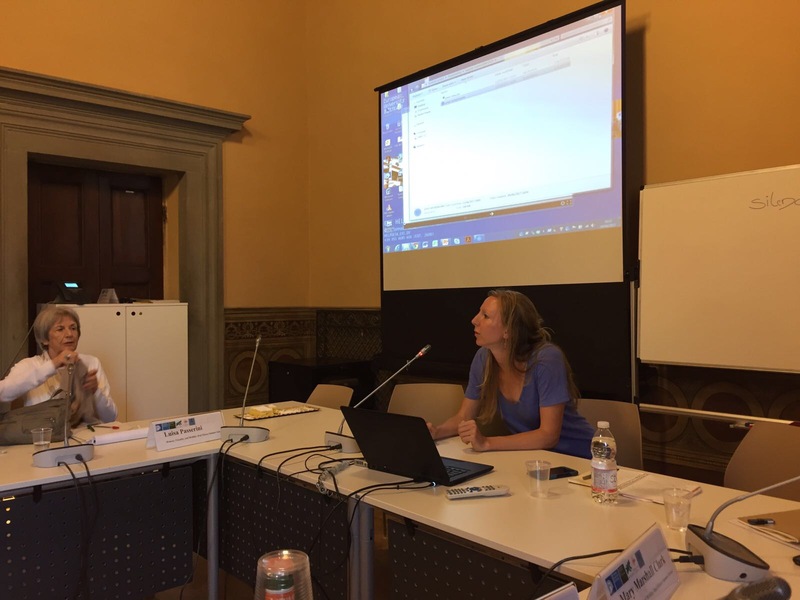 Each meeting will host a migration expert whose presentation will focus on themes in migration in one of the five world regions. 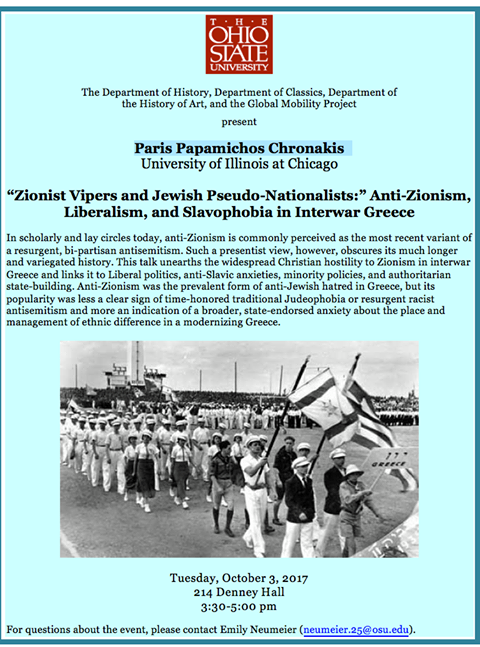 Following the presentation there will be time for a discussion based on a pre-assigned reading covering the topic presented. Teachers are invited to attend as many sessions as they’d like and are eligible to earn a contact hours’ certificate for each session attended, and one C.E.U. for attending all five sessions. Please visit the CSEES website for more information. My summer research has been very fruitful. Attending the Expeditions “Off the Beaten Track” ethnographic field school, Gozo, Malta, in June 2017, I was able to further refine my research skills. The field school taught me several lessons about being an ethnographic researcher that were critical in my summer research project. The Global Mobility Undergraduate Research Grant provided me with my first experience as a researcher, and practicing ethnographic methods at a field school was fantastic preparation. To date, I have conducted several interviews with a diverse group of Iraqi women. These women arrived in the United States between 1988 and 2013, and range in age between 30 and 62. My sample includes women who are married and divorced as well as with and without children. The women I interviewed speak excellent English. These women learned English in Iraq rather than the US; they studied in universities, watched movies and television, and listened to music in order to expand their vocabulary and become comfortable with the language. Each woman has completed or is working to complete a higher education program. 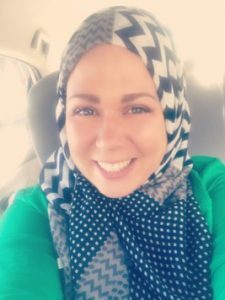 In my project, I wanted to learn if Iraqi women faced new challenges as Islamophobia increases in the US. Preliminary findings show that programs and educational opportunities provided by local communities and friendly neighbors are essential to the process of adaptation for Iraqi women. 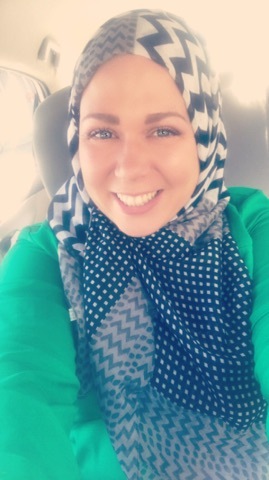 The opportunity to learn American culture and customs among friendly, helpful, American born (native born) community members, and peers who are also learning (including immigrants from other countries) gives Iraqi women opportunities to feel comfortable. My findings suggest that Islamophobia may not be a challenge when native born North Americans have the opportunity to meet and become friends with Iraqi immigrants. While none of my current informants wear the head scarf (hijab), I anticipate that future participants will. They may also struggle with English, and lack degrees in formal, higher education. 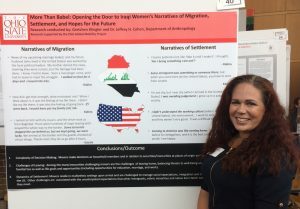 Women’s experiences vary drastically when they discuss their migration. One woman walked several days in the desert to arrive at a location where her life was no longer under direct threat. Another gathered her things and drove to Jordan, while a third flew to Jordan. Nevertheless, most women had transit time for 6-12 months between the time they left Iraq to the time they came to the United States. There are some exceptions: one woman waited 5 years in Iraq before she was able to leave due to life events that caused changes in her legal status and affected her paperwork. Another woman had a very different experience: she packed her belongings and fled Iraq in a week’s time. In 3 out of 4 cases my informants were threatened with death and chose to leave to preserve their life. My informants are looking forward to stability in their lives and for their families and children. They all hope that their children will find jobs and promotions, educational opportunities live healthy lives in the future. When I asked my informants to comment on their futures, the current political climate was not an immediate factor. However, the continuous edits to the Trump administration’s “travel ban” remain a cause of serious concern, particularly for women who planned to return to Iraq to see family. Although the Supreme Court ruling in late June exempted Iraq from the list of countries in which individuals without ties to the United States are barred from entry, the looming threat of once having been included in this list remains an ever present reminder of their “otherness” even as legal residents and citizens. One woman, who is an American citizen, is concerned for her upcoming trip to Iraq – her first in over 10 years. She is concerned about her return and she is taking precautions to remain safe in Iraq. Another woman would like to visit her family in Iraq but feels she cannot risk it. She is not an American citizen, and she worries about the uncertainty surrounding the administration and the possibility that she may be denied reentry, separating her from her son who would remain in the US. Becoming an American citizen or being an American citizen is critical for these women. Their interest is not necessarily due to patriotism – although every woman celebrates her appreciation and gratefulness to the United States – but its foundation stems from the fear that she may not be able to return to the United States if she is not a citizen. Aspirations of citizenship for those who are not currently U.S. citizens has taken on new meaning as the ideas of security and stability shift.